1.If the SSD is brand new, please go to "Disk Management " to "Initialize" it when you use it for the first time, if not, it will not show in "My Computer". When connected successfully, you could find it named ''JMicron Tech SCSI Disk Device'' on your computer. 2.New SSD should be created a new partition, please use the Disk Manager in windows to create new partition. M.2 NGFF PCIE NVMe SSD to USB C Type-C SSD adapte is suitable for M.2 SSDs with PCI-E (M-KEY) interface type, adopts Type-C interface. 【M.2 PCI-E NVMe SSD to USB-C Adapter】CHOETECH M.2 PCI-E NVMe SSD to USB Type C adapter is designed specifically for M.2 PCIE NVMe SSD, you can transform an M.2 PCIE NVMe SSD into a portable external drive. The M.2 PCIe based with USB Type-C connector supports 10Gbps max transmission speed, providing ultra fast read and write speed for latest desktop and laptop,maximizing utilization. 【USB Type-A and Type-C Supported】To accommodate devices with different USB ports, the M.2 PCI-E NVMe-based is engineered to convert to a USB Type-C port, offering flexibility of being used on different platforms with either USB Type-A or Type-C port.It is strongly recommended to connect the USB3.1 GEN 2 USB C cable to reach 10GBPS high efficiency. Note: Package included is a standard usb a to usb c cable. 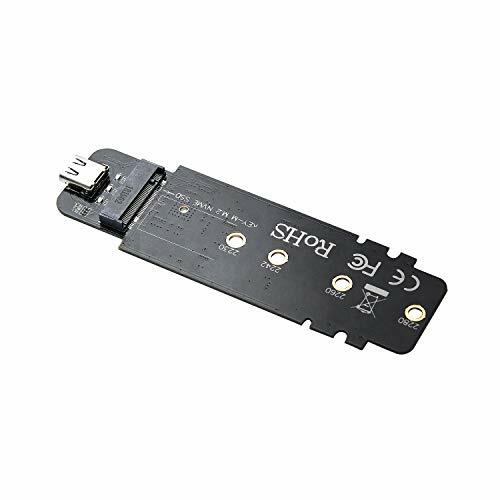 【Quick and Easy Installation】Just insert an M.2 SSD into the connector on the adapter and screw the M.2 SSD onto the adapter.No driver installation required. When combined with M-Key M.2 SSD (Not Included), it will increase the ability of IOPS of SSD, and reduce latency and energy consumption significantly, improving the performance of your SSD greatly.